ePhoto Inc. is your one stop shop for all quality supplies for photography and video studios.We cater to professional photographers and videographers with our extensive selection of photo and video equipment. Our mission is to provide the best price and service to our customers. 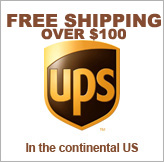 UPS ground shipping in the lower 48 States USA! - However we do not cover return shipping back to us for refunds or exchanges. Please note, we do not pay for any customs duties or taxes that may apply to your order. We offer a 30 day return policy however we charge a 20% restocking fee. If you want to return the purchase please include your order number and reason for return.